Beansprouts are rich in enzymes, also a rich source of proteins, moisture, vitamins and minerals. Good for anemia, cardio vascular health, constipation, stress and tiredness..etc. Adding sprouts in our daily diet is a real challenge. The raw taste of the sprouts is not liked by much people. So combining it with something attractive is required to make it striking and really tasty. Crack eggs; add little salt and beat well. Heat oil in a pan ; add the onion and saute for thirty seconds. Now add the beansprouts and little salt to saute for fifteen seconds. Now make a space between the sprouts mixture and add the beaten eggs. Scramble them till it starts to become separate into ball stage. But it should not become too dry. Now stir in the beansprouts with eggs and cook for further fifteen seconds and turn off the heat and allow the mixture to cool. 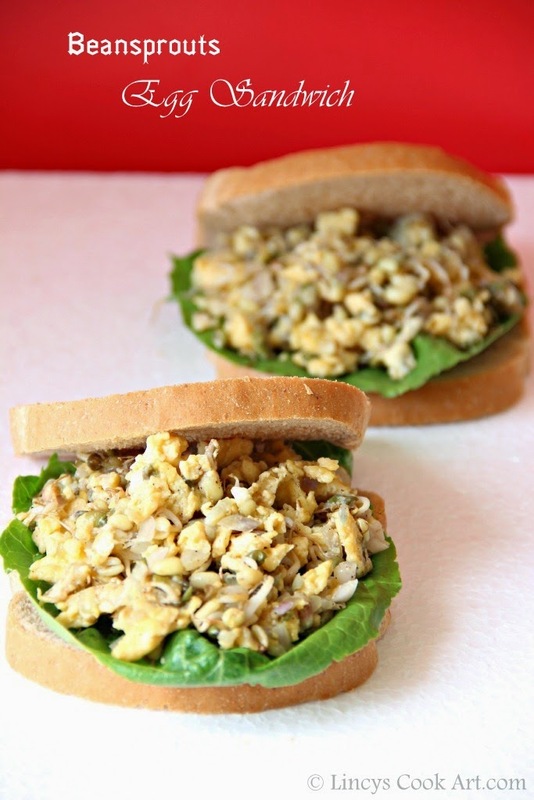 Take a bread slice; keep the lettuce and add two tablespoon of sprouts egg filling. Cover with another slice of bread and press slightly to stick both slices together and serve. If you feel this beansprout filling is not moist to hold the bread slices together add a teaspoon of Mayonnaise and mix well before filling. Love the addition of sprouts in sandwich,brilliant idea. love the idea. got to try it for breakfast.. Healthy , tasty &filler sandwichs.